Povidone iodine is an antiseptic used for topical application. It is used for adjunctive treatment and prevention of infection in lesions, cuts, ulcers and post operative wounds. Each dressing contains ointment with Povidone Iodine I.P…..10.0% w/w & Metronidazole I.P….1.0% w/w. 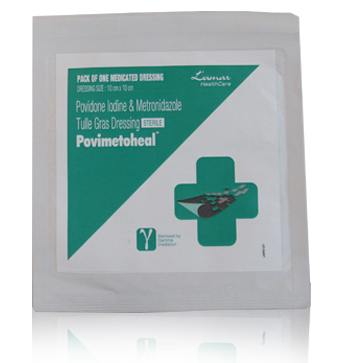 Povidone iodine is an antiseptic used for topical application. It helps to treat and prevent the infection in wounds. Metronidazole helps to reduce redness, swelling and inflammation.